WUHAN -- A white-flag dolphin has been seen in Yangtze River in east China, just days after a leading Chinese scientist said the animal was likely extinct. A man with a decoration company in east China's Anhui Province spotted a "big white animal" in the river at Xuba ferry in Tongling, Anhui, at 3:10 to 3:20 pm August 19, and filmed it with a digital camera, said Dr. Wang Kexiong, of the Institute of Hydrobiology of the Chinese Academy of Sciences. Judged from its appearance and living environment, the animal in the footage was confirmed by the institute to be a white-flag dolphin, known in Chinese as "baiji", Wang said. Because few of this species still live in the Yangtze River, their chance of mating is slim, said Wang Ding, who added that a measure is to gather these animals in one section of the river for breeding. Zeng Yujiang, the man who spotted the dolphin, told Xinhua, "I never saw such a big thing in the water before, so I filmed it. It was about 1,000 meters away and jumped out of water for several times." 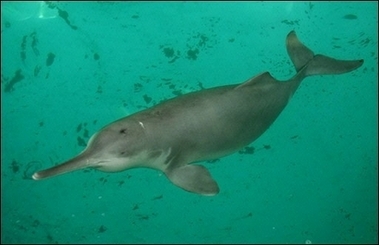 The footages were sent to the Tongling freshwater dolphin nature reserve to determine what the animal was. A staff with the Institute of Hydrobiology of the Chinese Academy of Sciences, who happened to be in the nature reserve, then brought the footages to the institute based in Wuhan, capital of central China's Hubei Province, which was well-known for research on baiji. A team of 25 scientists from China, the United States, Britain, Japan, Germany and Switzerland failed to find any white-flag dolphin during a 38-day search last year. Wang Ding, a leading expert on the species from the hydrobiology institute of the Chinese Academy of Sciences and head of the team, said earlier this month "This result means the baiji is likely extinct." If the white-flag dolphin is extinct, it will be the first cetacean to vanish as a result of human activity as it is on the top of food chain in Yangtze River and has no natural enemy, according to Wang Ding. The professor is planning a trip to Tongling with some experts. "I hope we could find that white-flag dolphin then," he said.